More than ever before, ColecoVision Super Game Module brings home the arcade experience with computer-age precision! 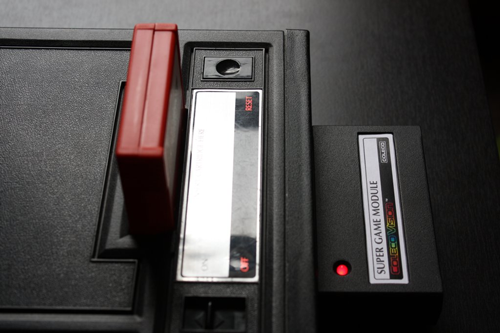 The Super Game Module plugs right into the Expansion Port on your ColecoVision console and plugs you into a world of finer-than-ever game detail! After you've hooked it up, just slip in a Super Game cartridge and you're ready for the video game experience of a lifetime! Super Game cartridges capture every last detail of arcade games...the subtle nuances like "intermissions" and the special extras too. You can even post the initials of the high scorers on the screen... just like in the real arcade games. The unit adds another 32 Kilobytes of memory (RAM) and a much better sound chip (General Instrument AY-3-8910 Chip).